Updated Debian on the server only to find it broke something in Foswiki I have the same combination of Debian Wheezy and Foswiki 1.1.9 working fine on other systems at work, but on this server (and the backup) it doesn't play nicely. Rolling back Debian isn't an option, so I've temporarily installed this web site on a slightly earlier version of Foswiki, which doesn't appear to have any issues. Hopefully it will be a fairly straight forward fix, and I can get everything current again. My ISP sent a text to say the issue has been resolved. So far it looks like they're right. The site will be unavailable for much of the time over the next week. 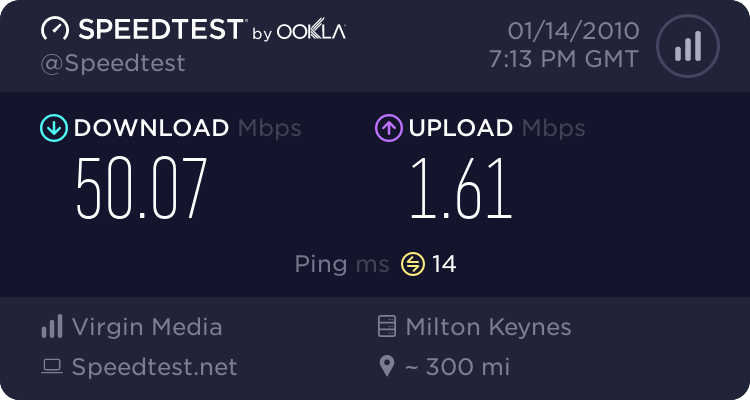 Issues with my ISP means our broadband connection stays live for as little as 10 seconds before dropping and attempting to reconnect. I've been given the date of the 15th for it to be fixed, but I hope it will be ready before then. That took longer than I hoped, with the speed upgrade finally kicking in at the end of July. They didn't bother with the upload speed until the final tweak to download speed was completed. It's now 120Mbit down and 12Mbit up. The ISP are doing another round of network upgrades. Download has doubled to 100Mbit and the upload should double to 10Mbit soon. 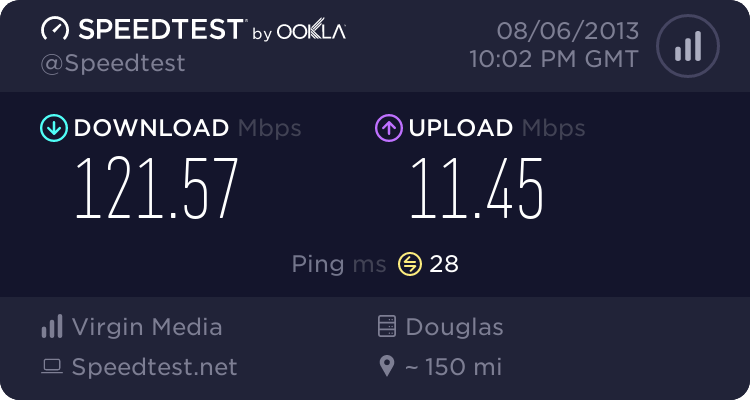 My ISP finally fixed the upload issue two days ago - six months after it went wrong. In the meantime i've had yet another engineer visit and I had been expecting a call to arrange more detailed analysis of the problem. 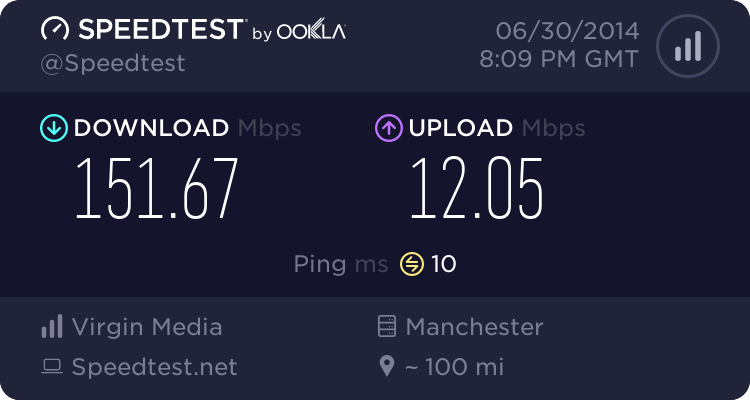 That didn't materialise so I was resigned to wait until July, when the speed (both upload and download) should be doubled. As of Sunday afternoon the upload has gone back to around 5mbps, so this site should feel swifter. A couple of weeks ago my modem locked up and after a reset it was running again but with the upload reduced back to the old 1.6 mbit setting. I rang up to ask why and the upshot was an engineer visit and a modem swap. 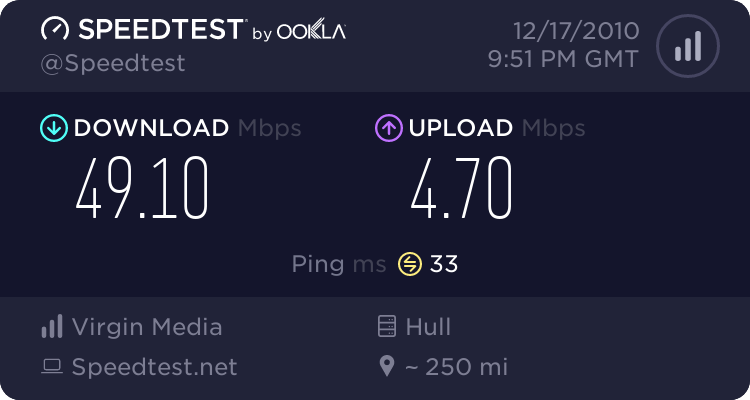 No change to upload speed. I rang again on Monday and this time they decided to drop the modem from the network and then reconnect it to see if it picked up the correct settings. The drop worked - the reconnect didn't and our internet connection was gone . I've just had another engineer visit with yet another modem to get broadband going again - still with the low upload settings. Turns out it's a more widespread issue affecting other people in the area. They expect it to be resolved by the middle of next month. There have been a few changes since the last update which didn't make it here until now. The virtual machine this runs on was updated to Debian Squeeze earlier in the year. VirtualBox was upgraded to version 4 (currently 4.0.10) which is now much easier, as the OSE versions are now available as prebuilt binaries, including as .debs from their own repository. Foswiki is now at version 1.1.3. The primary hard drive in my desktop machine failed a couple of weeks ago. Fortunately the only unrecoverable partition was /home, which was fully backed up thanks to Back In Time. Foswiki has been patched to 1.1.1 and VirtualBox is now at version 3.2.10. Finally got the replacement RAM (the delay was down to me rather than Crucial) and that seems to be working fine. Host upgraded to Ubuntu 10.04 LTS. Took just over an hour including the downloads. Boot up time has certainly improved. VirtualBox now at version 3.1.6. The server has been running fine with no more problems - which is nice. We did have a four hour or so internet outage this afternoon which just came back a few minutes ago. The RAM was replaced under warranty and I gave that a three hour memory test to be on the safe side. No problems reported so the server is back up with its full complement of RAM. After 16 hours of Memtest86+ the original RAM showed no errors, so the server is back up and running with just that. VirtualBox is back at 3.1.4 as the issues on the server & guest VM look to have been down to the faulty RAM. I still want to move the host server to Debian, but hopefully the server will be stable enough for the time being and I can do the upgrade at a more suitable time. Well, it had been running smoothly for a fortnight so of course I decided to upgrade VirtualBox to 3.1.4 which came out at the weekend. Not good. The virtual machine has dropped out three times and taken the server with it twice Back on 3.1.2 for the time being. RAM upgrade on the host server, bringing the host up to 8GB and this vm to 3.6GB. As the vm is still a 32bit Debian Lenny install it's not able to use memory beyond that. No recurrence of the page allocation failures since moving to the Realtek NIC so far. Before switching NICs the error cropped up within a day on 2.6.31, so I'm hopeful it's sorted. Still more struggles with the server. It managed a week without the allocation errors, running on a 2.6.28 kernel, until I had a large amount of files to move from my desktop to the server over the gigabit link. The error happened again at the start of the transfer. After a reboot into the latest kernel I can trigger the error most times I do transfers, but it happens at other times too. I've now put in a Realtek gigabit card and will see how it goes with that. The errors don't seem to do much beyond expanding the log files, but that doesn't make them any less annoying. Foswiki 1.0.9 is now available. This server has been running the release candidate (1.0.9rc2) for the last week and it's worked well. VirtualBox is at 3.1.2 but I just cannot get a stable host system with the 2.6.31* Karmic kernels. I also think setting the network adapter to use the virtual Intel PRO/1000 device causes instability too. There are no problems with a 2.6.31 kernel and VirtualBox on my backup server. That may be down to it being a 32bit host install - this is on a 64bit Athlon II machine - but I still can't pin down a cause. Still getting the occasional page allocation error even with the old kernel from Jaunty. Updated VirtualBox to 3.1.0 without any improvement, so trying again with 3.1.2.